SEATTLE, WA—A four-year, $682,000 grant from the Andrew W. Mellon Foundation awarded to the University of Washington will help four university presses and the Association of American University Presses (AAUP) create a pipeline program to diversify academic publishing by offering apprenticeships in acquisitions departments. The collaborative project involves the University of Washington Press, the MIT Press, Duke University Press, the University of Georgia Press, and the AAUP. 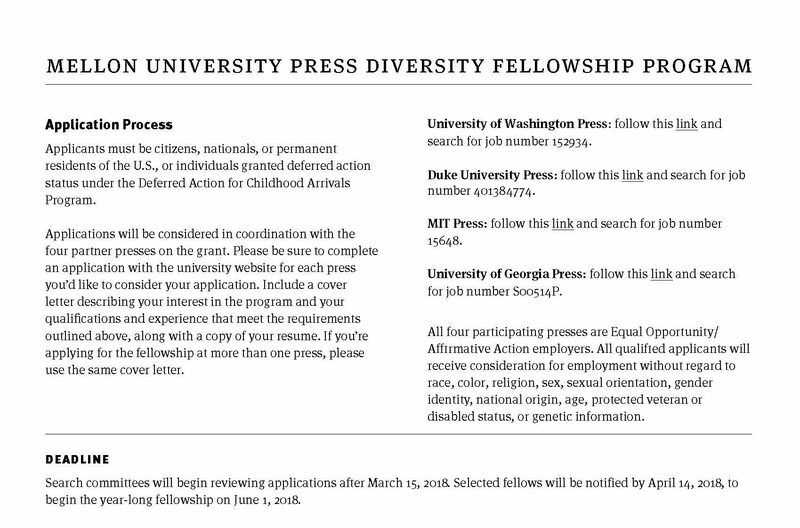 The University Press Diversity Fellowship Program will create cohorts of four fellows per year for three years. The program will recruit fellows who have significant personal experience and engagement with diverse communities and a demonstrated ability to bring the understandings gleaned from such engagement to the daily work of academic publishing. The University Press Diversity Fellowship Program is the first cross-press initiative of its kind in the United States to address the marked lack of diversity that characterizes the publishing industry. 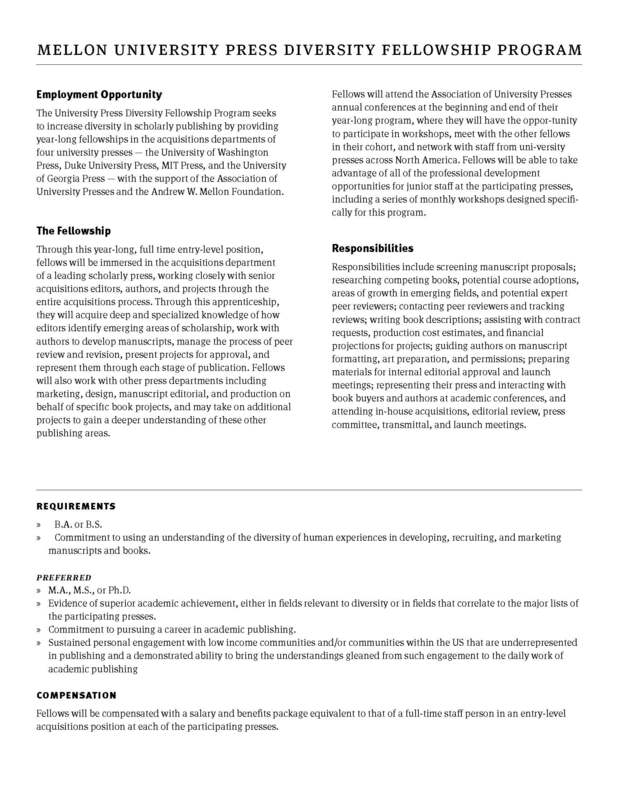 Although university presses have long fostered and supported diversity-related fields such as Native and Indigenous studies; African American studies; women’s, gender, and sexuality studies; and Asian American studies, the fellowship program represents a significant investment in creating career development opportunities and a supportive environment for diversity publishing. Another desired outcome of the fellowship program is to develop best-practice strategies and tactics for fostering diversity at all levels of the profession. Further, this collaboration will focus attention on the centrality of diversity in all its forms to the future of global academic discourse and, it is hoped, will inspire related efforts to prioritize diversity more broadly in the publishing industry. The program will offer each fellow opportunities for one-on-one mentoring as well as monthly cross-press video conferences led by staff at partner presses, covering a range of topics designed to supplement the hands-on training. Outreach and recruitment by the program’s selection committee will begin this month, with the first cohort of Diversity Fellows starting their apprenticeships in June 2016. Larin McLaughlin, Editor in Chief of University of Washington Press, at 206-221-4995 or lmclaugh [at] uw.edu. Gita Manaktala, Editorial Director of The MIT Press, at manak [at] mit.edu. Courtney Berger, Senior Editor & Editorial Department Manager of Duke University Press, at cberger [at] dukeupress.edu. Mick Gusinde-Duffy, Assistant Director for Acquisitions and Editor-in-Chief of The University of Georgia Press, at mickg [at] uga.edu. This entry was posted in AAUP, News, UW Press News and tagged academic publishing, diversity, publishing, Race and Equity Initiative, scholarly publishing, University Press Diversity Fellowship on January 14, 2016 by uwpressblog.